Have you had your Omega-3’s today? 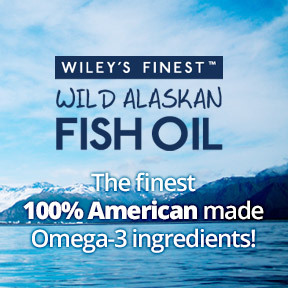 Professional Supplement Center is excited to announce that we now carry Wiley’s Finest Wild Alaskan Fish Oil products. Owned and operated by the Wiley family since 2008, these 100% made in the U.S.A. products are produced from sustainably caught wild Alaskan, coldwater fish by American fisherman operating in American waters. Their fisheries management system is regulated to protect the environment, while providing the purest quality Omega-3 products in support of optimal health and wellness. In addition to supporting everlasting sustainability of their primary fish populations, Wiley’s is committed to supporting green, renewal energy initiatives. Any remaining fatty acids removed during the concentration of Omega-3 oil is supplied to a biodiesel alternative fuel company. All oils are processed in an FDA compliant facility located in Coshocton, Ohio using cold extraction that results in an 85% Omega-3 yield. Molecular distillation removes any fishy odor or taste, resulting in extremely fresh and pure tasting oil. This concentrated oil is then carbon filtered to remove any environmental contaminants such as PCB’s, chlorinated organ pollutants or toxic heavy metals. Before encapsulation into easy to swallow softgels, every single lot of ingredients and finished products is NSF Certified and is independently tested by third party laboratories to ensure there is no lead, cadmium, mercury or arsenic contamination. From start to finish, all ingredients are 100% U.S. sourced, refined, and packaged by American workers to supply the finest quality American made Omega-3 products. Cholesterol Support ON SALE – Specifically formulated to promote cardiovascular health, this unique formula provides 800 mg of pine tree plant sterol esters in addition to 800mg of advanced 75% Omega- 3 concentrated EPA and DHA. Gluten and soy free formula. Easy Swallow Minis ON SALE – These mini soft gels are half the size of other servings but still pack in 630 mg of concentrated EPA and DHA per serving. Easy to swallow with no fishy aftertaste, these balanced minis are gluten and soy free. Orange Burst Liquid Fish Oil ON SALE – This is the perfect product for those who prefer liquid delivery of high levels of Omega-3’s. Gently processed to preserve the natural micronutrients vitamins A and D and the super antioxidant astaxanthin, one teaspoon provides 4500 mg of purified fish oil. While flavored with natural orange, the rich orange color is reflective of the natural diet of the wild fish. No artificial colors are added. Peak Omega-3 Liquid Fish Oil ON SALE – This great tasting liquid fish oil is naturally lemon flavored and is presented in a guaranteed 90% triglyceride form. One teaspoon provides 2150 mg of EPA and DHA per serving in support of joint and heart health. This entry was posted in Home and tagged Cholesterol Support, Easy Swallow Minis, fish oil, Orange Burst Liquid Fish Oil, Peak Omega-3 Liquid Fish Oil, Professional Supplement Center, Vitamins and supplements, Wiley's Finest Wild Alaskan Fish Oil, www.professionalsupplementcenter.com. Bookmark the permalink.